ZEPHYR is a great example of Ted Hood's popular Little Harbor 53 Series, boasting fine workmanship throughout and a unique cockpit design that allows one person to handle all sail controls without leaving the helm, as well as easy access each side without stepping up. Her proven hull design features generous beam and displacement to provide exceptional living and storage space, as well as remarkable stability and seakindliness offshore. 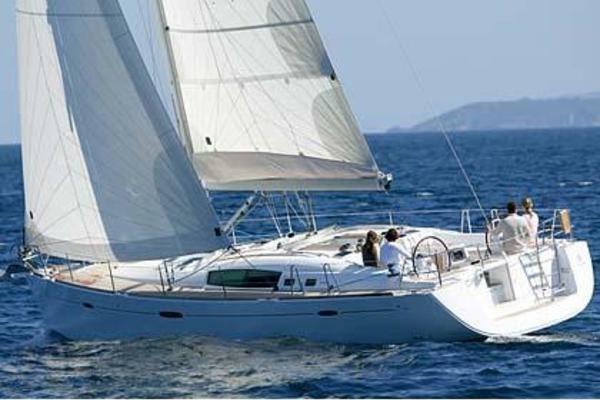 The low wetted surface hull is also easily driven in light wind by a high-aspect sail plan. Upwind performance is enhanced by a deep, efficient centerboard that increases draft to 11'-4" when lowered. ZEPHYR features a rare three-cabin layout with owner’s cabin aft with queen berth, VIP cabin forward with queen berth, and second guest cabin forward with twin berths. Only three Little Harbor 53/54s were built with this highly desirable and versatile layout that works well at sea and at anchor. ZEPHYR has a relatively new engine, generator and sail inventory, and also benefits from many other recent upgrades. The current owner purchased her in 2010 and is looking to move up to a larger yacht. For anyone looking for a high quality, comfortable and seaworthy sailing yacht, you will find no better value! United Yacht Sales New Jersey would love to guide you through a personal showing of this 53' Little Harbor 53 1987. This yacht for sale is located in Portsmouth, Rhode Island and priced at $499,000. For a showing please contact us by filling out the form on this page and we will get back to you shortly! ZEPHYR sleeps six in three private staterooms, with two heads and two stall showers, plus two berths in main salon. The interior features traditional Little Harbor teak joiner work with solid teak trim, teak veneer and solid teak and holly floorboards, all finished in satin varnish with gloss accents. All exposed hull surfaces are lined with varnished teak ceiling strips. The overhead is of removable white Formica panels with teak trim. Hanging lockers are lined with aromatic wood and have automatic lights. All other lockers above seat level are meticulously lined with teak or Formica. Galley countertops are Corian, while all other countertops are marble. The head and shower floors are molded FRP covered with teak grating rounded off on the edges for comfort. Varnished teak towel racks, toothbrush/cup holder and other accessories are provided to match the interior. Canvas lee cloths are installed for all berths. Ample shelving, bookshelves and handholds are provided throughout the interior. There are sheets, bed covers, shams, pillows, mattresses and area carpets. All water and fuel tanks are below floor level, providing extensive storage under seats and furniture throughout the interior. All wiring and plumbing is completely hidden from view behind removable panels. Nav Station Aft of the salon on the port side is a fully functional nav station with built-in nav instruments and a full seat, while inboard and just aft of the companionway are custom electrical panels, all easily accessible from the cockpit. Owner's Cabin Dual passageways from either the galley or nav station lead aft to the owner’s cabin, which features a generous queen berth on centerline (new 2012) with seats on both sides. There are overhead lockers outboard, two hanging lockers and multiple drawers and lockers, as well as a vanity with removable seat on the forward bulkhead. Light and ventilation are provided by a large deck hatch and four opening portholes. Owner's Head and Shower A private head with separate shower stall is to port, featuring an electric toilet, vanity sink, mirror, teak grate and opening porthole. Canvas covers for all exterior varnished teak, dinghy, outboard etc.